We talk to Euan Murdoch, Chief Executive of Chamber Music New Zealand, about its recent mixed-ability performance combining students from Kimi Ora School of Wellington and the Enso String Quartet of the United States, led by musician Julian Raphael. 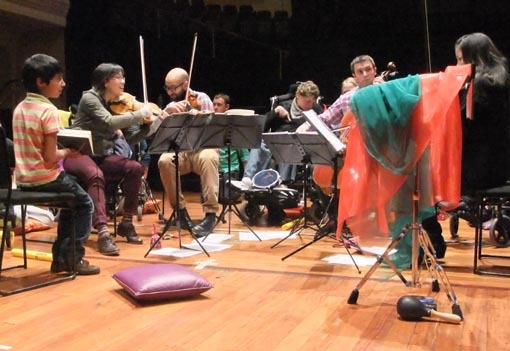 In late 2011, Chamber Music New Zealand was one of 11 organisations and venues to receive a grant through the Arts For All programme, a partnership programme between Arts Access Aotearoa and Creative New Zealand. The aim of the grants was to support projects that would improve the accessibility of the recipient. Q. Why did you want to present a performance involving young people with an intellectual disability? A. Over the past 18 months, we’ve been working closely with the team at Arts Access Aotearoa to really broaden access to our live chamber music events. We believe that all New Zealanders should be able to engage with the world-class musicians we present, so it was important for us to create a relaxed experience for people who might otherwise feel uncomfortable in a regular concert setting. When we had the opportunity to apply for funding through the Arts For All programme, it gave us the perfect opportunity to bring these ideas to life for the first time. Q. What do you think worked particularly well during the performance? A. I can’t stress enough how important it was for us to work with the right musicians for this project. Not just in terms of their artistic excellence but also for their ability to be open and engage beyond their comfort zones. Enso were fantastic at this and with the talented Julian Raphael leading the event, the performance with pupils from Kimi Ora School really came together. I was also very proud of my staff team who fully engaged in this project from the beginning. There was plenty of energy and colour in the Town Hall that day! Q. Will you do it again? If so, what might you do differently? A. This was the first time we had created an event like this and I’m sure there will be learning for us to take away. So far, the feedback has been overwhelmingly positive. With a few tweaks here and there, we will definitely be looking at creating a similar event next year. Chamber Music New Zealand presents chamber music concerts throughout New Zealand. It is a member of the Arts For All Wellington Network, a partnership between Arts Access Aotearoa and Wellington City Council. Original generation time 1.8304 seconds. Cache Loaded in: 0.0004 seconds.